Some of you may recall the T-Bone System, and I'm aware that at least one astute reader is following me on it, but there was some excitement a couple of seasons about the Overs in such matches. The creator of the original T-Bone System, I'll call it T-Bone Raw, was very excited about the outcome of backing Overs as an additional revenue stream alongside the Money Line and Run Line returns. Whilst both the Money Line and Run Line profits are steady enough in the last five seasons, the profitability of the Overs component is something new this season, and rather a mystery. I always like a situation where both the SU and the RL are pretty much in synch - think it adds strength to the finding. Personally, not keen on the Overs here - all the profit seems, I think a bit strangely, to come from when the total has been set high - in direct contrast to the earlier years when overs did better on low total lines. Quite a change round that I cannot get my head around. The 2016 season ended with the Overs winning 62% of the T-Bone games, which was certainly interesting, but there was no apparent reason to get too excited, but it was something to keep an eye on perhaps. I'm sure I returned to the topic in 2017, pretty sure I haven't in 2018, but I will today as it appears the pendulum has fully swung the other way with Unders now the order of the day. As an indicator for how tough the Run Lines in baseball are to beat long term, of the 1,359 T-Bone qualifiers from 2007, the Overs have won 646, the Unders 648 with the other 65 resulting in Pushes. Unders this season are currently at 59.8%. The Totals bet was never part of the T-Bone system, but if you're tracking results, it never hurts to look at other markets. 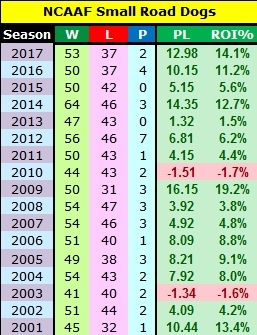 The good news is that the T-Bone continues to perform after a less than exciting 2017 season. The bad news is that this is a system that loses its efficacy after the All-Star break, as I mentioned last month, which is actually perfect timing with football and American football kicking in (pun intended). The EPL Draws got off to a winning start this season with Wolverhampton Wanderers and Everton coming in yesterday. I hope at least some of you were with me. And now the really bad news. I am off again for work tomorrow on a short notice trip, but at least I'm clocking up the miles and points for trips and car rentals on my own time. After updating them yesterday, I realised they actually have value which should be included in my net-worth spreadsheet. After that, I will be spending two weeks with my son and youngest grand-daughter, followed quite possibly by a surgery and its associated downtime the following week or two, so I may be gone from a while. Read up on Small 'Dogs in American Football if you're bored, need money, or both. Actually, if you need money, the last thing you should be is bored. Enjoy the rest of summer. If the surgery doesn't work, enjoy the rest of your lives. It's shorter than you think. ...because while the spreadsheet did indeed end the month in profit as expected, the work trip ended in a small disaster as I was taken ill with a recurrence of March's issues, and consequently spent my first three days back 'home' in hospital. The one silver lining is that any doubt about whether a surgery is really needed to fix the issue permanently has been made clear, and I'll be out of action yet again for maybe another couple of weeks, fairly soon, probably next month. There aren't so many blogs on my blogroll being updated regularly these days, but one that had received an update was perennially successful Skeeve's Betting With Skeeve which kindly mentioned one of my earlier posts, even going so far as to call it hilarious. I have to agree, and also have to say that I have still not received a reply from the William Hill representative who was so keen to reach out to me initially, and while I'm tempted to follow up, I'm not sure any response would be triggered. Feel free to comment on Skeeve's blog - he's using a lack of comments as a somewhat feeble excuse for not posting more often. I think that there is a huge disconnect between the reality and the fantasy of what a professional bettor or gambler is. A jet-setting lifestyle it is not, at least for most who call themselves professionals, and many so-called professionals aren't professional gamblers at all, but make their money from selling betting related products. Hi there - I'm glad you enjoy the blog, which makes clear that with discipline, it is indeed possible to be profitable over the long term from betting. However, it does not encourage anyone to rely on these profits as their sole or main source of income. In this regard, my advice to you would be to gamble in your spare time, while you build your career. Full-time betting isn't the dream life some people think it is, either in terms of profits or lifestyle. It is actually quite boring, and comes with none of the benefits of a career - paid time off, national insurance / retirement pension contributions, share options, life insurance, and a steady increase in pay as you become more senior and climb the ladder. It's also a very lonely activity. There are no promotions in full-time gambling, no increases in benefits, just a constant battle to find new edges as the ones you find are inevitably found by others. For the most part, the claim to be a full-time professional gambler is simply someone putting a more positive spin on being unemployed and spending their dole money on gambling. A small amount of research reveals that so-called successful gamblers are, in reality, to be found living very ordinary lives on housing estates in less than glamorous locations, often still living at home with parents (if not in a caravan parked out front), or in rented accommodation and relying on charity for their children's health needs. It's not something to strive for. And try getting a mortgage without a steady and verifiable income. There are rare exceptions of course, but in my opinion it is far better to pursue an income from gambling by making it a hobby. There are plenty of opportunities at all times of the day, and you have none of the pressure of having to win to pay the bills, which leads to bad decisions. The skills you need to be a successful gambler are skills that are valued in the workplace. Why not apply them there, receive a steady and increasing income, and gamble in your spare time? To get started, I'd say find a sport you are interested in, ideally not a major sport where your competition is well financed and resourced, and try to think why the market might not be efficient in certain areas. Research and test those ideas with small stakes and build from there. You don't need a lot of money to get rich, but you do need a lot of time and an edge. The bigger the edge, the less time you need, but edges will erode over time so you will constantly need to come up with new ideas. Which isn't easy. Good luck, but don't give up your day job. Possibly not the answer my friend wanted to hear. It is certainly possible to win a decent amount of money from investing on sports, but once you have some money behind you, there are far easier ways of making money. Some of you may recall a fairly recent post about Tesla. The stock has certainly had an interesting month. On the 1st of the month I almost peed my trousers when the Q2 results were announced and shares shot up by 16%, while on Tuesday I almost peed my hospital nightgown when I read CEO Elon Musk's Tweet about taking the company private at $420, which triggered an 11% gain. This is not a stock for our parents perhaps, but the squeeze on shorts this month must have given Mr. Musk much pleasure. And finally, the EPL is back, and for anyone looking for draws, the likely lads this opening weekend feature two of the promoted teams. First today's big London derby between Fulham and Crystal Palace, followed by the rather less anticipated (at least in my house) Wolverhampton Wanderers v Everton game tonight. The system generating these selections has been profitable in each of the last six seasons with a total ROI of over 20% from an average of 58 games a season. While there has been at least one draw in every one of the last six opening EPL weekends, the better value is to go for the surprises, which is not surprising given the number of personnel changes teams have made over the summer. Backing the least likely outcome in those 60 games is +30.36 points (an ROI of 50.6%). Personally I am hoping Crystal Palace both score, and pick up a point, before game eight of the season this time around. Playing a 31 game season doesn't work for me too well when everyone else gets 38.